I have a problem with my LibreOffice (and it is quite urgent as the deadline for my master thesis is in two days). The problem is spacing. 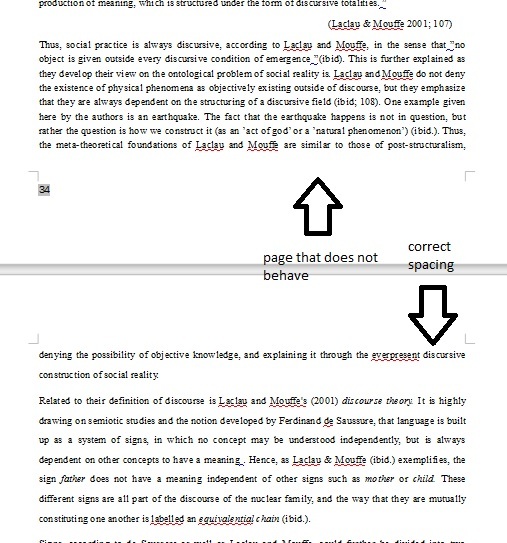 For some reason, one page in my document seems to not follow the spacing have chosen. I have double checked a million times, and according to libreoffice, the spacing, formatting, and font size is the same.I did try to erase the formatting and adding it again. the only way it differs is what I see in the document. LO is behaving correctly. You have probably activated the Orphan and Widow control in the Paragraph. This setting prevents a single or partial line to be at the beginning of a page or at the end of a page. Set the 2 controls in Paragraph, Tab "Text Flow" to your desire.